Joan Baez, Melissa Etheridge, Jennifer Hudson, Queen Latifah, Chris Rock and Stevie Wonder Added to Presenter Lineup for Music's Biggest Night™ Sunday, Feb. 11, on CBS. SANTA MONICA, Calif. (Jan. 30, 2007) -- In an historic GRAMMY® moment, the Police (Sting, Stewart Copeland, and Andy Summers) will reunite and perform together for the first time on the GRAMMYs when they open the 49th Annual GRAMMY® Awards telecast on Feb. 11, it was announced today by The Recording Academy®. 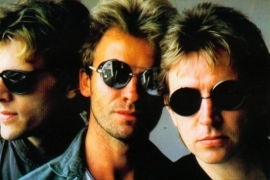 With five GRAMMY Awards to their slate of accolades, the Police, one of the most famous bands in the world, create a purely original sound by infusing reggae with pop and rock -- a sound that will be heard 'round the world from the GRAMMY stage. Also, new presenters added to the all-star line-up include current Lifetime Achievement Award Honoree and multiple GRAMMY nominee Joan Baez, three-time GRAMMY winner Chris Rock, and 21-time GRAMMY winner Stevie Wonder. The music industry's premier event will take place live on Sunday, Feb. 11, at STAPLES Center in Los Angeles and will be broadcast in HDTV and 5.1 Surround Sound on the CBS Television Network at 8 p.m. (ET/PT). The Police join a stellar list of past GRAMMY Awards opening acts, which includes reunions and once-in-a-lifetime performances: the ever-animated Madonna sharing the stage with the Gorillaz (2006); an all-star, stage-filling spectacle that featured The Black Eyed Peas, Maroon5, Gwen Stefani, Los Lonely Boys and Franz Ferdinand (2005); Prince and Beyoncé in an electrifying duet (2004); and the reunion of legends Paul Simon and Art Garfunkel (2003). Previously announced performers include Christina Aguilera, Beyoncé, Mary J. Blige, the Dixie Chicks, Gnarls Barkley, John Legend, Ludacris, John Mayer, Corinne Bailey Rae, the Red Hot Chili Peppers, Justin Timberlake (solo performance and with the winner of the "My GRAMMY Moment" competition) and Carrie Underwood. Previously announced presenters include The Black Eyed Peas, Ciara, Nelly Furtado, Terrence Howard, Samuel L. Jackson, P!nk and Rihanna. The show also will be supported on radio via Westwood One worldwide and XM Satellite Radio, and covered online at GRAMMY.yahoo.com. The 49th Annual GRAMMY Awards are produced by John Cossette Productions in association with Ken Ehrlich Productions for The Recording Academy. Ken Ehrlich and John Cossette are executive producers, Walter C. Miller is producer/director, Tisha Fein is the coordinating producer, David Wild is the writer, and Tzvi Small is supervising producer. Musical directors for the telecast and pre-telecast are Rickey Minor and Larry Batiste, respectively. Established in 1957, the National Academy of Recording Arts & Sciences, Inc., also known as The Recording Academy, is an organization of musicians, producers, engineers and recording professionals that is dedicated to improving the cultural condition and quality of life for music and its makers. Internationally known for the GRAMMY Awards, The Recording Academy is responsible for groundbreaking professional development, cultural enrichment, advocacy, education and human services programs -- including the creation of the national public education campaign What's The Download® (WhatsTheDownload.com). For more information about The Academy, please visit www.grammy.com.